The Montessori elementary Iron Materials can be very expensive to purchase. I searched everywhere to try find someone who could provide the files. Eventually I asked Abbie from montessorischoolathome, and she carefully traced all the insets for me. From these I’ve created these files using Autocad. Now you can print them off and make them yourself. Many homeschoolers just use simple cardboard. But I wanted the kids to be able to trace them. So I use framers board, which I get for free from my local framer. I purchased magnetic paper which I stuck behind the board to magnetize the boards. This also allows for us to work with these on a baking tray or whiteboard and they will stay still. The frames are made from framers board again, painted with magnetic paint. Then the frame I cut from foam board. Our little insets sit snug inside the foam board and it looks so neat. I will document this process soon, so that you can see the photo’s as I’ve done each step. In the next part, I’ll explain just how I made these. But for now, I just wanted to offer the files, so that if anyone needed them, they could immediately go ahead. I have now a completed file of all the Iron Material. 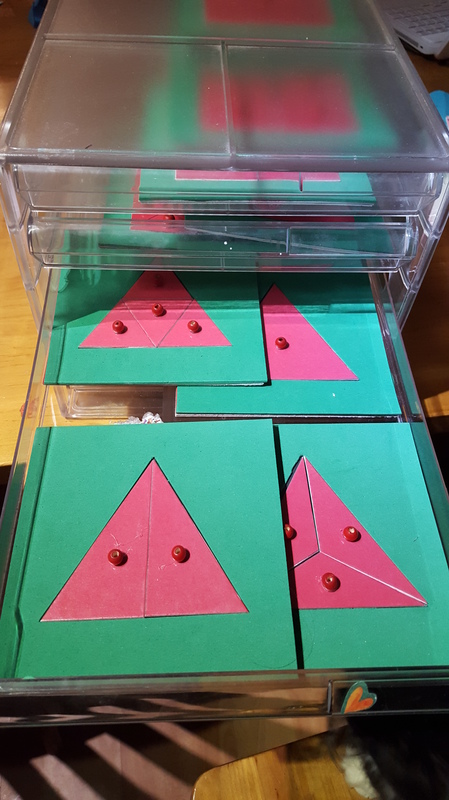 I’ve only made the Fraction Squares and Triangles, as the rest of the work goes way after so much other geometry work, I’ll only need them much later. Please download Dreambefore DIY Iron Material. One thing you will notice is, as much as possible, that I’ve drawn the shapes along one cutting line, instead of as shown in the inset frame. This I found helped with better cutting accuracy. I really struggled with how to organise the insets, as I don’t have a lot of space and wanted it confined. I found a perfect solution for us, was to use these simple drawers. So great to already hear that someone needs them. Wait until the rest comes out. My ones are already looking beautiful and so lovely to touch. Will you be showing pictures of how yours turned out? I’d love to see them! Absolutely! Coming soon. Also how I made them. 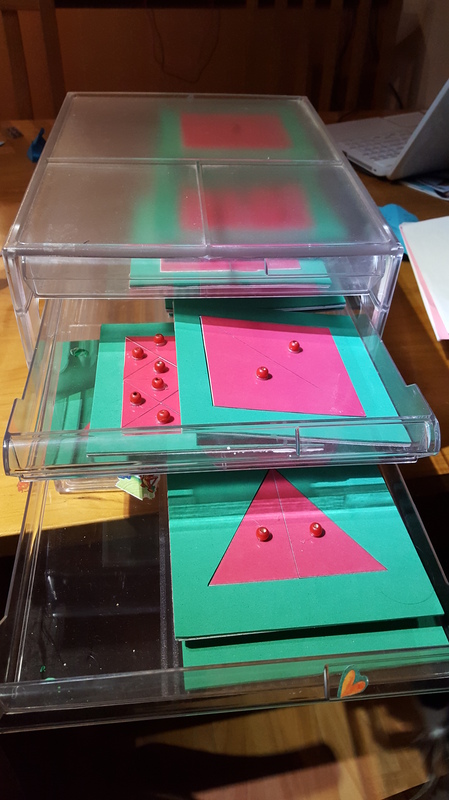 If you can get free offcuts of framers board from framing shops and have a guillotine (as the board is very firm and needs a heavy blade)($25 on ebay) – you are on your way to making beautiful Montessori manipulatives. I do not see the dimensions for the triangles – the ones that are whole, half, cut in thirds on the angle and cut in fourths. I really need to print those/make those, can you please help me? I did look at your DIY Iron Material file, but I didn’t see them in there. THANK YOU!! Sorry Sara, I only saw this now. Do you still need help? Just an FYI the squares are not for fractions but for teaching area. The fractions are taught with circles. I thought the same thing about the squares and only just learned their real purpose. Gee, thanks for that Crystal. I’ll check this link and make sure it’s the latest zip. Are you using them? Its done with autoCad, so exact! Tracey, I’m hoping maybe this post will make it to you, I posted a question below (and I will re-post it here for easy access), I’m hoping you can send an answer my way soon! I downloaded the materials for Iron Materials and I don’t see a page or dimensions for “L”. Could you respond here, or send me an email with that information, my address is EDIFIERARABIANS@YAHOO.COM I would also like to know how many pieces of foam board are needed in all for the Iron Materials (A through M). I am looking to make this soon, thank you so much for your response!! So sorry my reply comes so late. Making these files was very laboring. When I looked at M I thought it just wasn’t worth doing that last one. So sorry! But if you want the dimensions I’m happy to try find the print out sent to me. Tracey, I downloaded the materials for Iron Materials and I don’t see a page or dimensions for “L”. Could you respond here, or send me an email with that information, my address is EDIFIERARABIANS@YAHOO.COM I would also like to know how many pieces of foam board are needed in all for the Iron Materials (A through M). I am looking to make this soon, thank you so much for your response!! Me too! I’m looking for “L”.